A man accused of murdering the brother of two British teenagers, killed while fighting for Islamist jihadists in Syria, is to face a trial on 24 June. Abdul Deghayes, 22, was found stabbed in a car in Brighton after a crash on 16 February and died as a result of his wounds the following day. Daniel Macleod, 36, of Gipsy Road, London, appeared before Hove Crown Court by video link from Lewes Prison. He faces charges of murder and having cocaine with intent to supply. Mr Macleod will face a two to three week trial by jury and a plea and trial preparation hearing has been scheduled for 17 May. 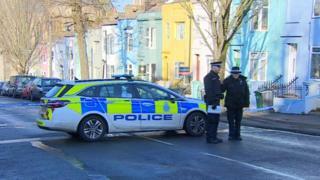 Mr Deghayes was the twin of Abdullah, 18, and brother of Jaffar, 17, both from Brighton, who were said to have become radicalised and died fighting with Islamists in Syria in 2014. It is believed their older brother, Amer, is still alive in Syria, having left Sussex in 2013. Mr Macleod was remanded in custody.